Growing up during the Second World War heavily influenced Mike Reynolds’ childhood aspirations. Although the war was over by the time he was old enough to join the army, Reynolds decided this was still the career he wanted to pursue. He was called up for National Service aged 18 in 1948, after which he decided to stay in the army; a decision that would lead to a long and varied career. He attended Sandhurst and was then commissioned as a Second Lieutenant in the Queen’s Royal Regiment. During the Korean War he was attached to the Royal Norfolks, and the chapter on his experiences during the conflict make for fascinating reading. Truly Britain’s ‘Forgotten War’, the conditions that the troops faced were reminiscent of the First World War – trench systems, cramped dugouts, and rats. During one patrol Reynolds was wounded and spent nine hours lying in no man’s land. He took a year to recuperate from his wounds after which, fighting to remain on active service, he became a training company commander. The Cold War era then saw a series of posts abroad, including time as a staff officer in Cyprus during the ‘emergency’ and as adjutant to the 1st Queen’s in Germany where he served under David Lloyd Owen of Long Range Desert Group and SAS fame. In August 1969 he was posted to Northern Ireland, witnessing firsthand the escalating ‘troubles’. During one riot he was injured by flying missiles. Further time was spent in Germany on exercises as part of the British Army of the Rhine, practising responses to a Russian invasion. In this era of heightened tension, with both sides preparing for nuclear attack, one wonders how useful these preparations would have been in the event of a nuclear war. Returning to Ulster in 1972, Reynolds spent four months in Derry and notes how the violence had increased, but although several of his men were wounded luckily none were killed. During this tour his men located and confiscated a staggering 6,720lb of explosives. By all accounts he was a natural leader, well-liked and respected – valuable qualities for any senior officer even during peacetime. 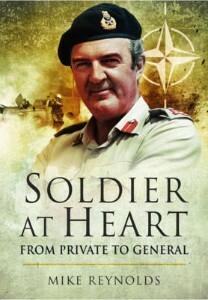 His career rise continued apace, from staff officer to Brigadier, to two star commander with NATO. For a time he was even was number two on the terrorist group Baader Meinhof’s ‘hitlist’, and had his own security detail. Reynolds retired in 1986 with the rank of Major General. However even in retirement he has remained active, serving as Colonel of The Queen’s from 1989-1992, publishing several books on Second World War history, and acting as a battlefield guide. Due to the number of military acronyms used, a glossary would have been beneficial, however this aside the book is well-presented and supplemented by various photographs from Reynolds’ career. The book is an excellent introduction to the post-Second World War activities of the British Army. Reynolds’ fascinating and varied career reflects both the changes in the British Army after the Second World War and the Cold War paranoia that dominated that era, and the meticulous notes and records that he kept help to provide a rich and detailed account of his career.